Although I usually give at least some forethought to choosing new plants, I impulsively bought a gardenia while doing my grocery shopping in March, which left me wondering if the bitterly cold winter had deprived me of all common sense. I just wanted something new and green! After getting home and belatedly realizing that I had no clue what to do with the gardenia, I put it in my kitchen until the weather finally turned warm enough to put it outside. Only then did I start thinking about where it might go. The front porch wouldn’t do—too shady. 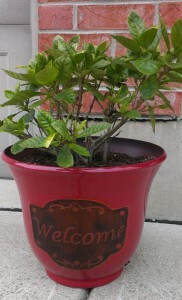 I bought a pot with a “Welcome” message, but was still pondering where to put the plant after I repotted it. Had I foolishly bought something for which I had no use? Thankfully, my husband came to the rescue by suggesting that it would look good outside the garage. We never had a plant in that spot before; but it seems to be doing fine there, and I like being greeted by the cheerful message on the pot when I pull into the driveway. Even though it’s just a simple, ordinary little thing, it gives a pleasant and comfortable feeling to coming home. That moment of impulsive shopping turned out for the best after all. I try to avoid randomly buying stuff just because it looks pretty, as that’s how the house ends up full of clutter; but there’s also something to be said for buying occasional small items to brighten up one’s home and life. I like being greeted by the cheerful message on the pot when I pull into the driveway. Even though it’s just a simple, ordinary little thing, it gives a pleasant and comfortable feeling to coming home. The whole point!! 😀 You will also be greeted with a delightful fragrance when in bloom! I agree with Becca! It sounds like you found the perfect place for the bit of joy you spontaneously bought. Very much so! I have to give my husband the credit for finding where to put it, though, because I was baffled! Gosh, this does look welcoming, indeed. A delightful bit of summer! Thanks — I’m very much enjoying the summer! Pingback: Nurturing Thurs – Give Up | "On Dragonfly Wings with Buttercup Tea"
That’s a good way to sort things… if it makes you smile, it’s worth keeping; but if it feels like clutter, that’s what it is.